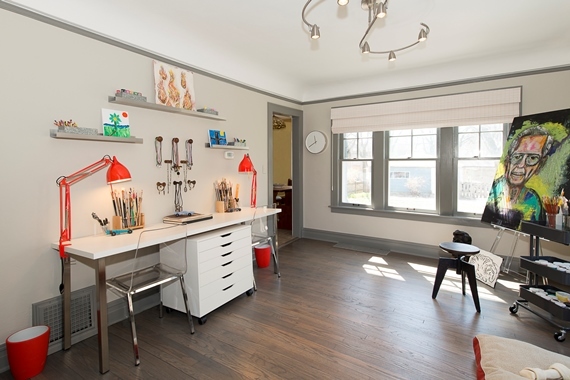 This summer a kit house in the Chicago area was featured on not one, but two, nationally broadcast television shows. 811 W. Grove, Waukegan. Photo courtesy of Lake County Assessor. Montgomery Ward Maywood. Scan from Antique Home Style. The entry after some landscaping improvements done on George to the Rescue. Photo courtesy of Sweet Peas Design. This summer, this Maywood model from Montgomery Ward was featured on both The Meredith Vieira Show and George to the Rescue. 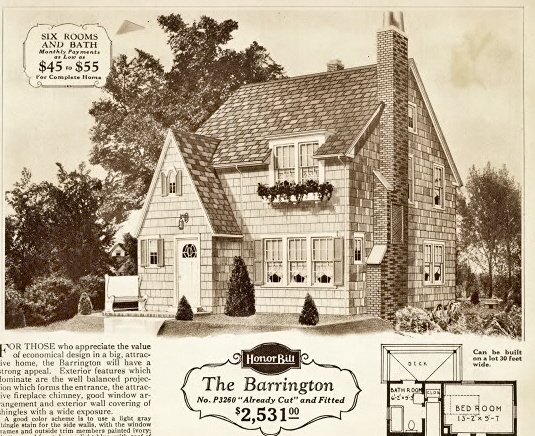 The homeowner believed the house was a Barrington model from Sears Roebuck. The models look similar but there is evidence to support the house is actually from Montgomery Ward. 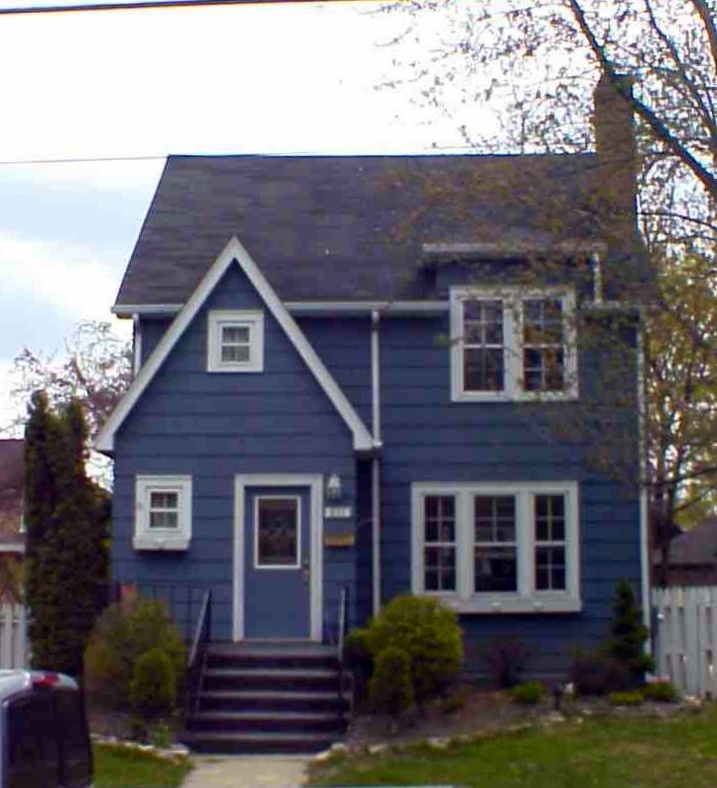 I believe this house to be a Maywood based on differences on the exterior, such as window placement, placement of the electrical fixtures, and the pitch of the roof of the front entrance. On the Waukegan house, there is a shed dormer over the windows on the second floor, but Wards also offered the model with that option. The house was built about 1928-1929. The house was in need of repair. Branches from a tree had fallen through the roof and it was leaking. The fireplace brick needed tuckpointing. The homeowner's sister wrote to the Meredith Vieira Show and made a wish that her brother's house could be fixed and remodeled. 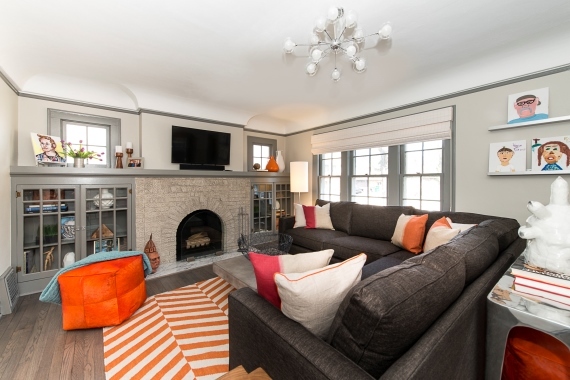 The homeowner and his sister were selected to appear on the Meredith Vieira Show. The show had the roof fixed immediately, and then enlisted the help of George Oliphant, host of the show George to the Rescue. 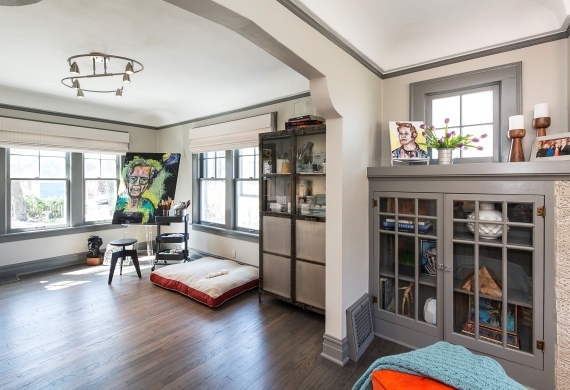 The Waukegan house received about $68,000 worth of improvements, including new hardwood floors, a new front door, new glass in cabinets, painting, landscaping, and new furnishing. The new living room. Photo courtesy of Sweet Peas Design. The plaster arch from the living room to the dining room. 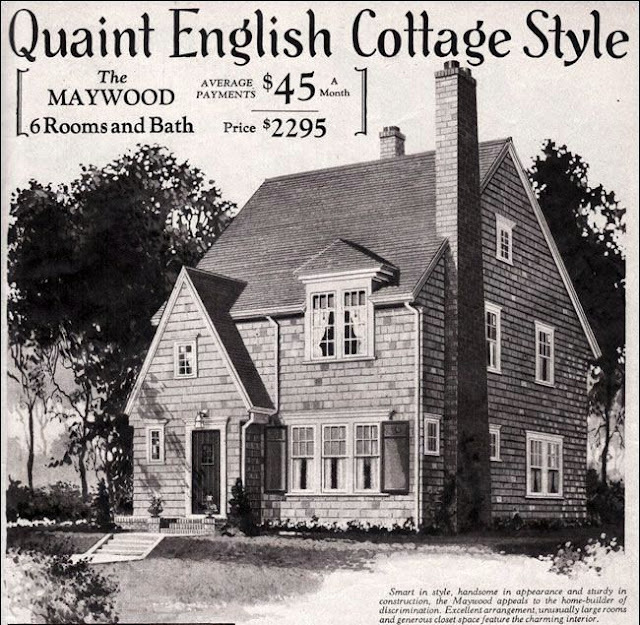 This "artistically designed" style was offered with the Montgomery Ward Maywood. Photo courtesy of Sweet Peas Design. The dining room has been converted into an art studio. The homeowner is a professional artist. If you look through the kitchen doorway, you'll see there is no breakfast nook, as you would see in a Sears Barrington. Photo courtesy of Sweet Peas Design. Great details to know about the interior differences between these two models that look so similar on the exterior. Good job, Lara! I could be wrong on this identification, but I feel pretty good about it!